The past few weeks, I’ve had ramen on my mind. But since I’m staying a bit close to home, I’ve had no chance to fill that craving. Actually, correction. I did manage to find a ramen place but it was just okay. So, when a friend casually mentions that there’s a newish ramen place called Yushoken at Molito, I knew I had to try it. I finally got that chance a few days ago, tiny baby in tow, desperate for ramen. The first thing that greeted us was a paper sign, saying that take-out and leftover bags aren’t allowed to preserve the quality of the ramen. It makes your eyebrow go up. If they think this highly of their ramen, it better be good. We were handed another piece of paper. It turns out that this simple piece of paper was their menu. Minimalist much? I was quick to make up my mind. Miso ramen for me, while my mom had the Tantan-men. I’ve heard good things about Yushoken, which made me worry. Will it finally appease that miso ramen craving I’ve been trying to fill? The last one I had was dismal at best, so I was anxious to find THE bowl I’ve been searching for. I was quick to adjust my camera settings, wanting to be able to take brisk snapshots when the food comes so I can eat as soon as possible. But things don’t always go as expected and little tummies are unpredictable. Yes, baby woke up, raising hell and demanding that she be fed. Why am I sharing this? Just to let you know that the food was so good, I didn’t care how difficult or messy it was to eat a bowl of ramen while you have an equally hungry mouth latched unto you. There was no setting my food aside while the baby cow eats; I had to eat while the food was fresh and tantalizingly sending appetizing aromas to my nose. I had a sip of the tantan-men as well. 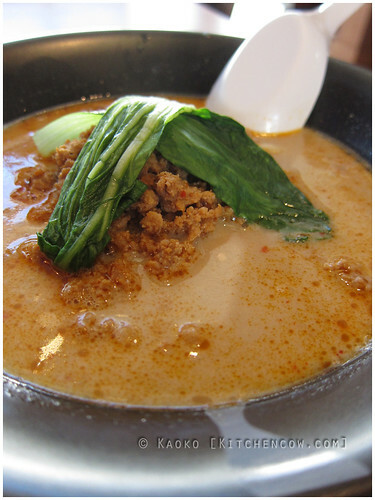 Yushoken’s version isn’t the super spicy tantan-men some places offer. Theirs is milder, allowing the other flavors to shine. Think meaty and spicy with a hint of sesame. 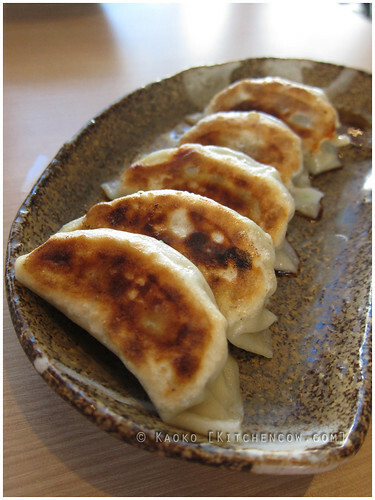 Aside from the ramen, we also shared a serving of gyoza. This Japanese dumpling quickly disappeared from the table, and not just because we were hungry. The meat was light and not at all oily, despite being pan-fried. Adding to the light and delicate feel was a herby flavor — shiso perhaps? 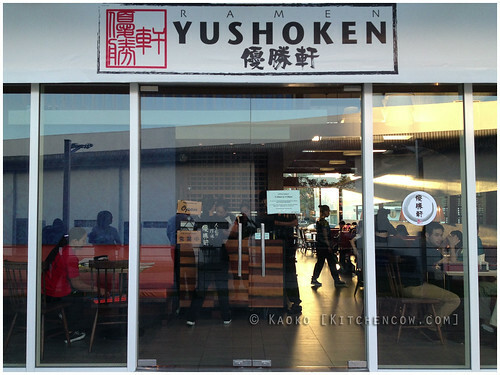 Ramen Yushoken is very much welcome in the South. 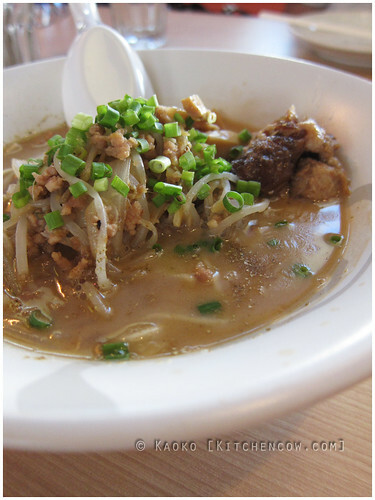 I’m extremely happy to know where I can appease my ramen cravings, and at a place so near at that. I’m planning a return trip this soon, so you can tell it really made such an impact on me. Hopefully, the baby cow will be more cooperative this time. It seems like I can’t wait for John’s day-off to try this; Oz and I made plans to hit it on Saturday! I have been hearing so much about them and have been wanting to try it…unfortunately my problem is the opposite, we are far from Alabang! We will make the trek one of these days though because I am dying to check them out!! The buzz is true. It is really really good. I hope you find the time, because I think it’s worth the drive. Dood, go for the shoyu. I’m still thinking about it. Like right now.